The waterfall of Rio Claro, (photo above by Alexandra Dias) popularly called Cachoeira da Fumaça, is located in Nova Ponte, 60km from the center of Uberlândia-MG and 72km from Uberaba-MG. It is considered the highest flow of water in the Triângulo Mineiro. The Fumaça Waterfall is one of the most beautiful rainforest in the Triângulo Mineiro. Its beauty is exceptional. The waterfall is approximately 60 meters high by 50 meters wide and the water volume is so large that a kind of water fog is formed which can be seen from the road, which is 360 meters away . Hence the origin of the name Cachoeira da Fumaça. Cachoeira da Fumaça and the several falls of the region are located in the Rio Claro, a tributary of the left bank of the Araguari River. 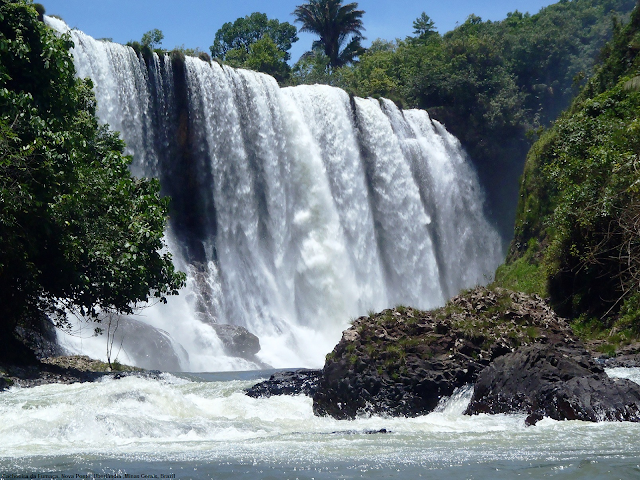 The falls are located on a private property, between the municipalities of Uberlândia and Nova Ponte, in the Triângulo Mineiro region. One of the most common ways to observe Fumaça Waterfall is by the trail to the left of the Rio Claro, which provides a side view of the waterfall and leaves you very close to the fall, from where you can see the river running over the basalt.